Quiet Veterans Memorial Park, one mile uphill from Old Monterey and the Fisherman&apos;s Wharf area, is a popular camping destination for many who visit Monterey. 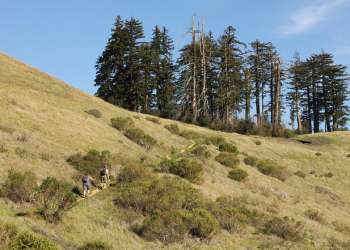 It is adjacent to the 81-acre Huckleberry Hill Nature Preserve, one of Monterey&apos;s hidden hiking treasures and a great family hiking destination. Both are abutted by the Presidio of Monterey. Veterans Memorial Park has 40 total campsites. 30 campsites are suitable for trailers. Every site is equipped with a table and a firepit. Veterans Memorial Park also has showers and restrooms. Campsites are available on a first-come, first-served basis. See the City of Monterey&apos;s website for detailed camping regulations and a list of current campground fees. Veterans Memorial Park is a popular area for picnics and overnight youth groups of up to 100. Both the three day-use picnic areas and the overnight youth group areas may be reserved in advance. See the city of Monterey&apos;s website for a list of picnic and youth group fees. Call 831-646-3865 to reserve. Veterans Memorial Park is adjacent to Huckleberry Hill Nature Preserve and is the best way to access that preserve&apos;s hiking trails. To get to the Huckleberry Hill Nature Preserve, take the Veterans Park Trail that abuts the western edge of the campground to the Presidio View Trail. Wildlife is frequently spotted in Huckleberry Hill Nature Preserve, as the aptly named Wild Boar Trail and Opossum Road show. The Wild Boar Trail provides excellent views of Pacific Grove and the coastline, while the Presidio View Trail rises roughly 700 feet and gives sweeping views of the city of Monterey. 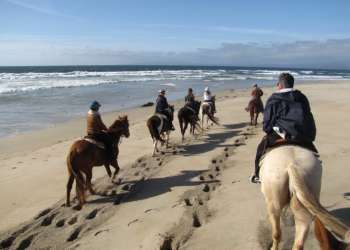 See the City of Monterey website for an information on trails and camping. A trail from the south end of Veterans Memorial Park leads south to the small but charming Quarry Park. Refer to this interactive Google trail map for details. Veterans Memorial Park offers a basketball court, play equipment and a lawn area suitable for Frisbee, softball and other sports activities. To reach Veterans Memorial Park from Highway One, take Highway 68 west to Skyline Forest Drive. Turn right on Skyline Forest Drive. Turn left on Skyline Drive. Follow to Veterans Memorial Park.